Proposals to raise the minimum wage, both nationally and locally, have gotten increased attention in recent weeks. President Obama renewed his call for a higher federal minimum wage during a speech on the economy at Knox College in Illinois last month. And fast-food workers in several cities have held one-day strikes or walkouts to demand higher minimum wages locally. The proposal faces stiff opposition in Congress from Republicans, particularly in the House. After Obama called for raising the minimum wage in his State of the Union speech, House Speaker John Boehner said the action would cost jobs among lower-income workers (video from AP). 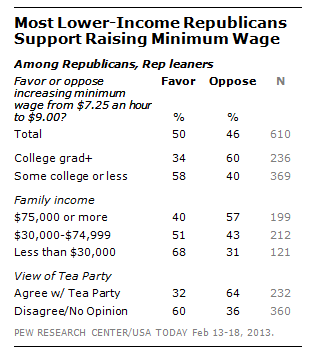 Overall, Republicans are evenly divided over raising the minimum wage (50% favor, 47% oppose). By contrast, large majorities of Democrats (87%) and independents (68%) support the minimum wage hike. Within the GOP base, there are sharp educational and income differences over increasing the minimum wage. Six-in-ten (60%) Republicans and Republican-leaning college graduates oppose the proposal, while about the same percentage of Republicans who have not completed college (58%) favor it. 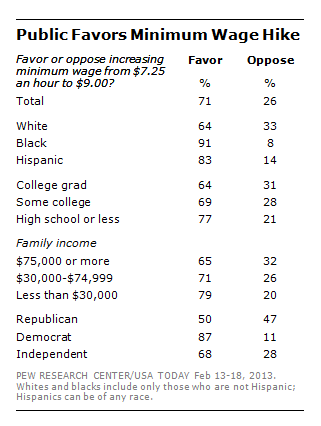 Higher-income Republicans (those with family incomes of $75,000 or more) oppose a minimum wage hike by 57% to 40%. Republicans and GOP leaners with incomes of below $30,000 support it by about two-to-one (68% to 31%). Tea Party Republicans (32% favor) are far less likely than those who do not agree with the Tea Party (60%) to support raising the minimum wage. Democrats are far less divided internally. Fully 87% of higher income Democrats and Democratic leaners favor raising the minimum wage, as do 82% of those with lower incomes. And support for raising the minimum wage is nearly as extensive among conservative and moderate Democrats (83%) as among the party’s liberals (90%). Danielle Gewurz is a Research Analyst at the Pew Research Center for the People & the Press.